Please excuse the photos in this post. 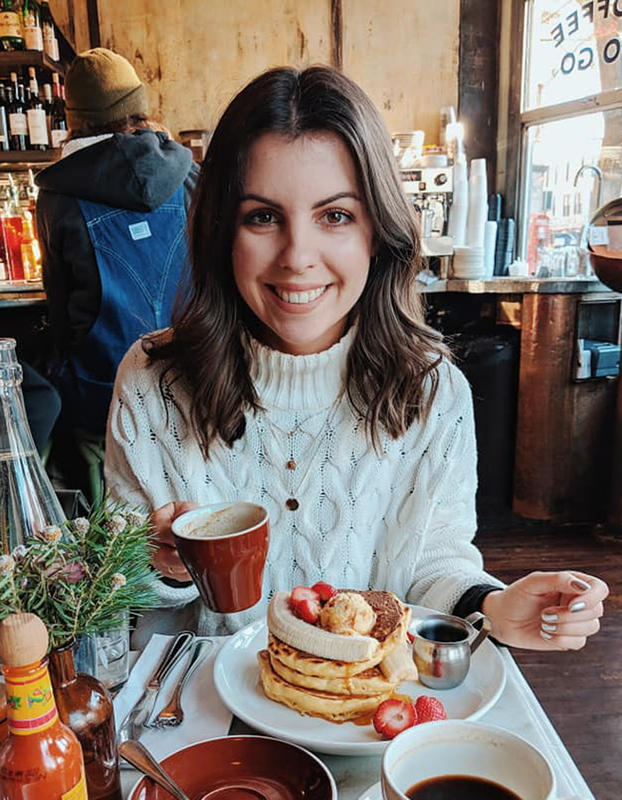 I wasn’t originally going to share this recipe, however, after posting a couple of photos to Instagram stories, I received so many requests for the recipe, that I decided too. Unfortunately this means that the photos aren’t of my usual quality though. 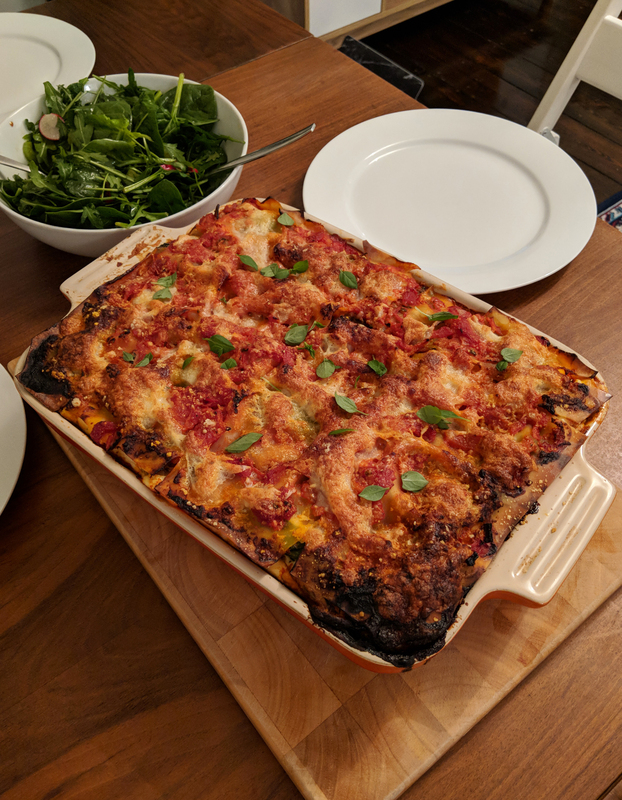 The table isn’t dressed, there’s no flat lay, but hey, this is real life, and this lasagne is too good not to share! In a nutshell, we used this recipe, shared on Inspired Taste. We found it by looking for a spinach and mushroom lasagne. It wasn’t originally quite what we were after, but I’m so glad that we decided to try our hand at making it, as it was so damned delicious. The only changes we made was to the mushroom layer, using portobello and chestnut mushrooms, and we did three layers of pasta sheets instead of two. 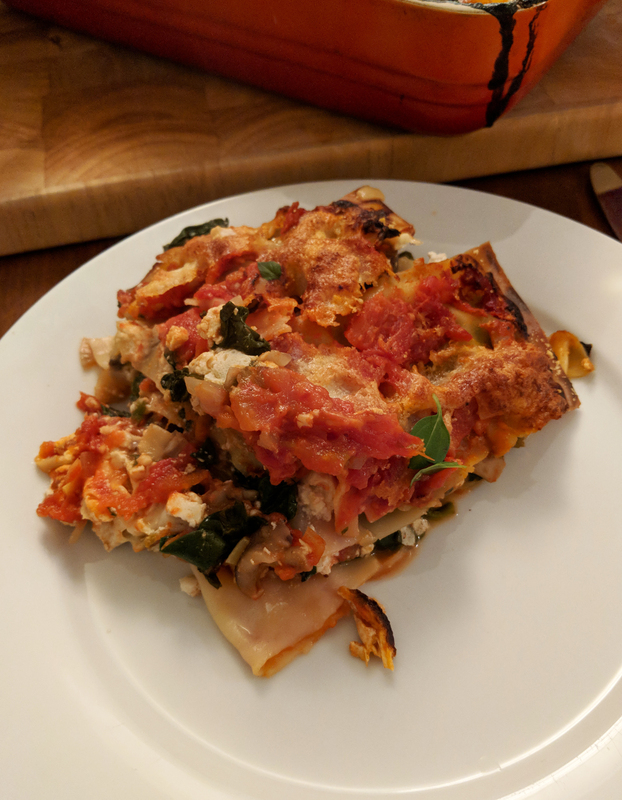 But otherwise, this is a triple decker lasagne, with three incredible fillings – ricotta, mozzarella and parmesan as a bechamel sauce, homemade peeled tomato marinara sauce, and a garlic mushroom and spinach layer. Yaaas! Begin by making your marinara sauce by heating a little olive oil in a large pan over a low heat. Add the onion and garlic, stirring occasionally until softened (about 8-10 minutes). Add the grated carrots and little salt, and cook for a further 3-5 minutes. Whilst the carrot cooks, pour the 2 cans of tomatoes into a large bowl (including their juices). Using your hands, or a potato masher, crush the tomatoes until they resemble a sauce like consistency. Add the tomatoes and bay leaf to the pan, stir thoroughly and reduce the heat to a low simmer. Cook, uncovered, stirring occasionally, for 20-30 minutes. Season with salt and pepper to taste, remove the bay leaf and stir in the chopped basil. Leave to one side. Pre-heat the oven to 180 degrees and lightly oil a large roasting dish. Heat a drop of olive oil in a large, deep frying pan, over a medium heat. Add the onions and mushrooms and cook, stirring occasionally until the onions soften. (Approx. 10 minutes). Add the garlic, spinach leaves and a little salt. Continue to cook until the spinach has wilted. Meanwhile, in a large bowl, mix the ricotta, eggs and a little salt and pepper. Stir until well combined. Now that you have all three components, you can begin to assemble your lasagne. Spread 1 cup of marinara sauce over the bottom of the baking dish. Arrange lasagne sheets, breaking some if necessary, to cover the sauce. Spread a third of the ricotta cheese mixture over the lasagne sheets. Sprinkle with a quarter of the parmesan and a quarter of the mozzarella. Add a third of the spinach and mushroom mixture, and dollop about half a cup of marinara sauce over the spinach. Add a second layer of lasagne sheets then repeat the steps above – ricotta, parmesan and mozzarella, spinach mushrooms and marinara sauce. Repeat once more with a third layer of lasagne sheets. Finish with a final layer of lasagne sheets, and top with the remaining marinara sauce, a sprinkling of parmesan and mozzarella. Bake for 30 minutes, in the centre of your pre-heated oven, covered in foil. Then uncover and bake for a further 10-15 minutes until the cheese is bubbling and browned. Season with any leftover basil leaves and serve with a side salad. Do you like lasagne? Will you be giving this recipe a try? It’s a great dish to make if you’re having people over for dinner. Especially at a weekend when you have a little more time to prepare and make it.